An artist's rendering of the town will be featured on a new Fairfield Map & Guide to be distgributed this summer. FAIRFIELD — The town is launching a new tourism and marketing campaign to showcase its nearly four centuries of history and current attractions. To promote the initiative, co-sponsored by the town and Fairfield Chamber of Commerce, a new Fairfield Map & Guide is being planned. Local businesses and organizations are invited to become sponsors of the map/guide, which “is designed to orient, inform and acquaint visitors with primary travel routes, the location of specific landmarks and historic districts, cultural assets, recreational areas and business centers throughout Fairfield,” according to organizers of the project. 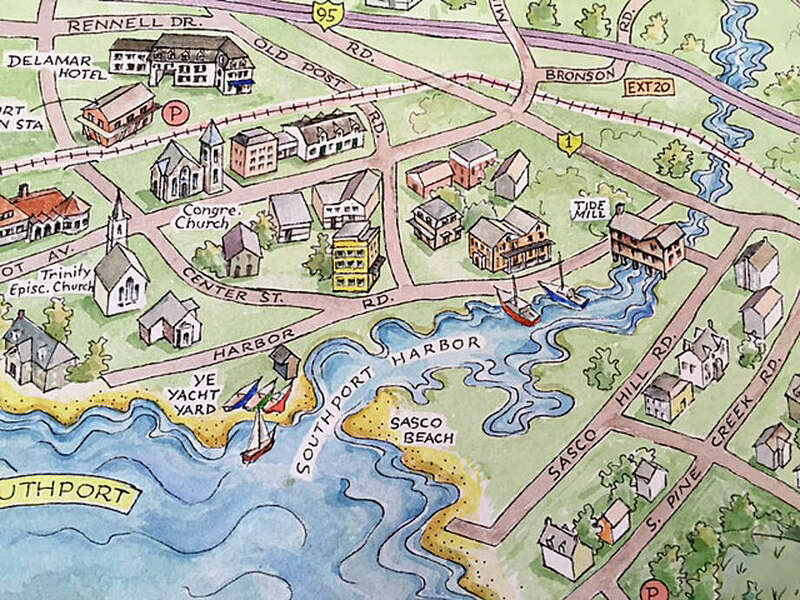 The map will feature a hand-drawn, watercolor illustration of the town by Massachusetts-based artist Bart Arnold. “Fairfield is the quintessential New England town with a rich, 375-year history, picturesque coastline and a vibrant downtown. There’s lots to see and do, and many places to eat, making Fairfield a great place to visit, relax and unwind,” Mark Barnhart, the town’s director of community and economic development, said in the press statement. More than 50,000 maps will be printed this spring and distributed at more than 280 locations in the New York metro area before the start of the summer tourist season. Sponsoring businesses and organizations will receive copies of the map to distribute to customers. Ads are available in the map/guide at a range of sizes and prices, planners said. Commitments will be accepted on a first-come, first-served basis through March 25. Businesses interested in being a sponsor should contact Meri Erickson, the project manager, at 203-561-7798 or meri@buzzmkt.com.